Blog entry posted on September 5, 2017 by Accessible Archives, Inc. This item appeared in the July 1917 issue of The Remonstrance. The Remonstrance was the official publication of the Massachusetts Association Opposed to the Further Extension of Suffrage to Women. First published annually and later quarterly in Boston from February, 1890 until October, 1913, it provided a forum for women who opposed the expansion of voting rights to women. 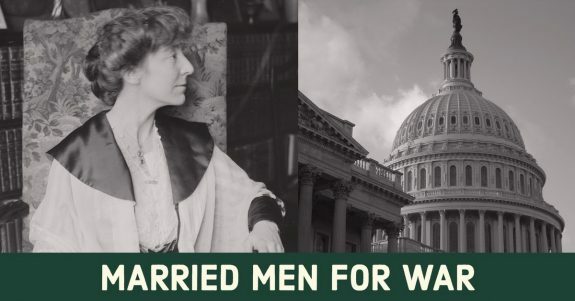 Miss Rankin, the Montana Congresswoman, who gained a conspicuous place in the headlines by her sobbing vote against war, has her own ideas as to how war, when it must come, should be carried on. The old principle is “Old men for counsel, young men for war.” Miss Rankin would reverse this. She would send the fathers of families to war, because they have already done their duty in domestic relations, but she would exempt “the young men who have not as yet selected their life-mates” and become fathers of children. The effect of this plan upon military efficiency is something which Miss Rankin does not think it necessary to take into consideration. Nothing would contribute more surely to the triumph of the enemy than sending out armies of the aged and middle-aged to face the German armies. But that, again, does not matter to Miss Rankin. Miss Rankin’s successive exhibitions do not tend to make us much more enthusiastic toward the prospect of a House and Senate made up, on the 50–50 basis, of anxious ladies and mediocre gentlemen. Superficial conversations would indicate that her career thus far has landed the suffrage cause the most decided wallop that it has sustained in a decade. We can do with very, very few of these feministic representatives, if the present sample is to be taken as indicating the general trend. This item, and others like it, can be found in Accessible Archive’s Women’s Suffrage Collection. We can provide access to fully searchable newspapers by and for women including The Lily (1849-1856), National Citizen and Ballot Box (1878-1881), The Revolution (1868-1872), The New Citizen (1909-1912), The Western Woman Voter (1911-1913), and the antisuffrage newspaper, The Remonstrance (1890-1913). Ballots for Women: Giving or Forcing? Mother and Son: No Relation Whatever!